Gimpel Fils was founded in 1946 by brothers Charles and Peter Gimpel and Charles’ wife Kay. They added "Fils" in homage to their father René, the dealer and collector whose journal Diary of an Art Dealer was first published in 1966. 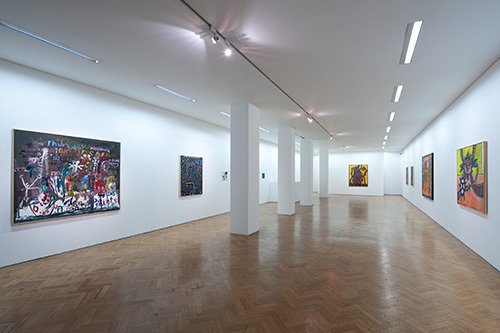 Today the gallery remains dedicated to its founding principle of exhibiting both modern and contemporary artists. Initially specialising in sculpture and abstract painting giving Lynn Chadwick, Anthony Caro, Peter Lanyon and Alan Davie their first exhibitions, Gimpel Fils has also worked with some of the most important artists of their generation including Marcel Duchamp, Yves Klein, Willem de Kooning and Larry Rivers. Since the 1980s film-makers and photographers were introduced to the programme. Current gallery artists working in these fields include Christopher Stewart and Araya Rasdjarmrearnsook. As the avant-garde have become the modern masters, so we continue to balance our commitment of supporting established artists, such as Albert Irvin, along with younger practitioners including Hannah Maybank and Michelle Dovey.